After playing sold-out crowds in Chicago and Miami from January through August of 2012 and again in the summer of 2013, House Theatre is thrilled to bring back this dynamic, award-winning, magic-filled production. Highly Recommended - 'Harry Houdini' is back in Chicago, and the magic still wows - Chris Jones, Chicago Tribune 5/17/16. "The planned Broadway musical about Harry Houdini remains stalled. But the House Theatre of Chicago's intimate, illusion-filled tribute to the justly celebrated scion of Appleton, Wis., is back in town. Handcuffs, straitjacket and all. I was a big fan of "Death and Harry Houdini" during its first Chicago run in 2013, not least because any self-respecting tribute to that incomparable master of prestidigitation must include an accurate and authentic rendering of his great illusions, especially his escape from the infamous Chinese Water Torture Cell, a feat of daring that dates back more than 100 years. Dennis Watkins — and, let us be honest: there could and would be no "Death and Harry Houdini" without Watkins — offers up that aquatic deed in full, along with an assortment of card tricks, sawings-in-half, levitations and the like. Unlike, say, a casino show from David Copperfield, the House performs in an intimate setting with the audience on two sides, which makes things more difficult for any illusionist. But it's a whole lot more fun to watch this re-creation of Houdini's most famous escape with your nose almost pressed up to the glass walls. Death & Harry Houdini - Tony Adler, 5/18/16. "Nathan Allen's play about the legendary escape artist has already cheated death a few times. It introduced the House Theatre of Chicago to Chicago in 2001, received a remount in 2003, then ran again in 2012 and '13. Now it's back for the House's 15th anniversary, with solid vital signs and perennial Houdini Dennis Watkins back in his water-torture cell. Basically a magic show nestled in a biography, the production recounts Houdini's life in the graphic-novel style the House has long favored, veering between the cartoonishness of Houdini's gibberish-spouting mama (rendered endearing despite her decades-long bad mood by Marika Mashburn) and a spectral, top-hatted embodiment of Death. As for the magic: though it loses the sense of raw wonder in a theatrical setting, it's accomplished with enormous cunning, elegance, and skill". 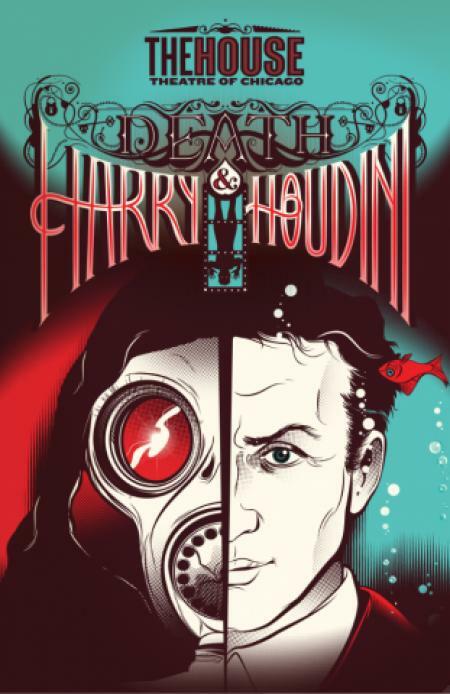 “Death and Harry Houdini” (The House Theatre): Be Astonished This Summer! - TheFourthWalsh.com. - "Who better to embody Houdini than Chicago’s favorite magician, Dennis Watkins? Third generation magician Watkins is on hiatus from his own show, The Magic Parlour at Palmer House, to resurrect the role he debuted in 2001. The charismatic Watkins mystifies with multiple tricks and feats. He enters the show suspended from a chain upside-down in a straitjacket. As he chats with the audience, he releases himself from confinement. And that’s how the show starts! Where could it possible go from there? A Chinese Water Torture is the ultimate finale! Watkins recreates Houdini’s act by being dropped head first into a water chamber. He is locked in. It’s disturbing and the process is too long for my comfort. Yet, Watkins reappears wet and smiling. In between these jaw-dropping stunts, Watkins marvels his guests with walking on broken glass and swallowing razor blades. There are even interactive audience moments of card tricks and brown bag swapping. The magic is in a word, MAGICAL! PG SIDENOTE: Even though this is a magical journey, death themes are strong. Parents beware". Death and Harry Houdini (2016) - www.ChicagoCritic.com - "With their long-running escape room The Last Defender playing downstairs, and their first show, Death and Harry Houdini being revived upstairs, The House Theatre has decisively conquered The Chopin. Both are major hits for the highly innovative company, which use non-standard storytelling techniques, and both, it so happens, force people to rely on their ingenuity to escape mortal peril. Magician Dennis Watkins stands a far better chance of prevailing than the defenders in the basement. In this latest revival, Watkins is at total ease in the role of Houdini, but Nathan Allen’s writing incorporates the escape and magic tricks into a story as exciting as it is tragic and ironic. With the addition of The House’s always evocative music, composed by Kevin O’Donnell, Death and Harry Houdini is far more than a parade of illusions; it captures the magic of theatre, as well. Watkins, as Houdini, enters suspended upside down in a straightjacket, which he wriggles out of while accompanied by the seven actor/musician ensemble members. The ringmaster (Johnny Arena) regales us with how Houdini was born a Hungarian Jew named Erik Weisz, immigrated to the United States with his family as a child, but lost his father at a young age. The figure of death (Tommy Rapley), striding in on stilts from behind the scenery, and wearing a gas mask as the modern equivalent of a plague doctor’s beak, is presented as a magician in his own right. With sweeping gestures, the phantom displays the saws it uses to cut the father in half, and spirits him away. After that, the young Erik became depressed, until he meets Dr. Lynn (Shawn Pfautsch), a performer whose illusions included conjuring and dissipating living creatures. Erik becomes the man’s apprentice, and takes the name Harry Houdini, in hope of finding a form of magic more powerful than death’s. A producer advises the young Houdini that his escape act is his most impressive and distinctive performance, and Houdini builds his career on freeing himself from increasingly elaborate locks, knots, and containers. The act also becomes increasingly dangerous, in line with Houdini’s scoffing at death. But before bringing on the famous water torture chamber, and Watkins includes it prominently in the second act, he performs several card tricks, illusions, and injury-defying feats while interacting with the audience. Besides being amazing in their own right, these moments are also used to illustrate the trajectory of Houdini’s career, as they become increasingly morbid and reliant for drama on the audience’s fear for Watkins’s safety. But the show is suffused with humor as well, and so far, the danger has always ended in relief. The ensemble is made up of House Theatre regulars, some of whom, like this production, have been with the company since its beginning. Carolyn Defrin and Marika Mashburn win big laughs as Houdini’s forever feuding wife and mother, and the actors display proficiency on mandolins, violins, drums, and even kazoos. (The other very talented ensemble members not yet mentioned are Rashaad Hall and Julia Merchant.) O’Donnell’s music is partly klezmer, and partly early blues, true to the vaudeville of Houdini’s time, and the costumes by Lee Keenan, scenic design by Collette Pollard, lighting by Ben Wilhelm, and movements of the actors are all consistent with the pre-naturalistic performance style (there’s even a silent movie about half-way through the show). The entire space feels like Houdini’s world, as seen through his own eyes. This was my first exposure to the show, which Allen revives every so often, and I’ve been told that a few of the magic tricks get switched up each time. All of them are astonishing, but of course, the water torture cell is the one everyone is most eager to see. It does not disappoint, but more importantly, the show establishes a significance for it greater than simply an escapist’s trick. People who have seen Death and Harry Houdini many times remain in awe of it. For those who haven’t yet, it’s a must-see"
Death & Harry Houdini - AroundTheTown.com - "Many of you have seen me use the phrase “Live theater is magical”! Anyone who knows me, knows that I truly feel this way. As “magical” as most theater is, there is one company that truly makes magic happen on their stage. This is The House Theatre of Chicago, where they are now presenting the return of their historical “Death & Harry Houdini”, presenting the story of history’s most famous “man of magic”, Harry Houdini and his war against death, the inspiration for most of his magic. Written by Nathan Allen, who also directs with stunning magic created and shared by Dennis Watkins, who is an amazing magician himself, this is two hours of pure theatrical magic (with a very definite emphasis on “magic”)! The story begins with the death of Harry’s father, where he declares he will find a way to beat death. While he knows that death is inevitable for everyone, he searches to defy the spirit of same and feels that he can conquer what is everyone’s destiny. During our historical journey, we watch him meet his wife, Bess (the lovely Carolyn Defrin, who is quite the dancer) make the Vaudeville circuit, learning and performing new feats along the way. Watkins, a highly rated magician on his own (if you ever get the opportunity to see his “Magic Parlour” show at The Palmer House, do see it!) during this production, walks on shattered glass, does amazing card tricks, levitation and makes his plans along with his younger brother Theo (played to perfection by Shawn Pfautsch, who also plays Dr. Lynn) to build the water torture chamber. We, the audience get to watch this historical magical trick as part of the show. The Chopin Theatre, where this production takes place, is a very intimate space, where audience members sit on either side of the “stage area” and during this particular trick, which takes place in the second act, no one is more than 100 feet away from the chamber itself. The best description for this feat of magic is WOW!!! There are some major surprises during this event, but I would never spoil the magic, and can only say that you won’t believe what you see. You will also see Watkins swallow five razor blades, drink water and later chew some string and then pull the blades back out, on the string, Another WOW! please! The ensemble that is assembled in this cast has been trained to work with the magic that Watson brings to the stage, and each one does each phase of the production to perfection. Tommy Rapley, Julia Merchant, Rashaad Hall, Marika Mashburn (who plays Mama, Cecilia Houdini) and Johnny Arena as our Ringmaster. Each and every cast member is an important cog in the wheel that makes this show keep coming back. From the musical numbers they play, the songs they sing and of course , the magic they make in bringing this story to its very important closure, they are intense, yet fun-loving and playing off the audience who gets involved throughout the production. Watkins is very big on getting them into the show, as he knows that they will then focus more and never lose interest. I must say, that would be impossible to do. The relationship between brothers and Bess and Mama is amazingly realistic. Side note: during intermission, I spoke with Watkins, who was saying that he may have done the water torture trick doing this production, more times than Harry Houdini himself would have done so. Houdini passed away at a young age and Watkins appears to be in great physical shape, so I am thinking he will in fact (if not already in the books) pass Houdini by and perhaps set a new Guinness Record. We will find out and let you know. The set is designed by Collette Pollard, with lighting by Ben Wilhelm and costumes by Lee Keenan. Kevin O’Donnell handles the sound and the original musical compositions with Brian DesGranges as the very busy stage manager, making sure that each magical piece is in the exact spot. Harrison Adams is a guest artist who worked with O’Donnell on the sound. This play was the first one that The House Theatre of Chicago brought to our city 15 years ago. The show has stood the tides of time and the theater company has grown to reach new heights and should continue to do so. They are great story-tellers, finding great stories to bring to their stage. Bravo!" What Eyes See and Ears Hear - ChicagoTheatreReview.com - "Erik Weisz was an Hungarian-born Jewish boy from Appleton, Wisconsin, who eventually evolved into the world famous Harry Houdini. His name became synonymous for mind-boggling magic. Houdini was a vaudeville headliner, an illusionist, an escape artist and, in his later life, became known for his death-defying feats involving straightjackets, handcuffs, chains and underwater escapes. All his life the magician sought to challenge and defeat Death, even promising to return as a spirit following his own demise on October 31, 1926. Even today, almost 100 years later, Houdini’s life and talent remains fascinating and mystifying to young and old alike. About fifteen years ago, on the 75th anniversary of the magician’s death, the House Theatre presented a more modest version of this play at the Live Bait Theatre. Today this play has grown into a jaw-dropping two-act play about the man, the myth and his magic. The script is the work of talented writer Nathan Allen, who also directs this dazzling production, and his close, magical collaboration with Dennis Watkins, the star of the play. In fact, everyoneharry1 connected with this production proudly admits that this play wouldn’t have existed without Mr. Watkins’ talent and determination. Dennis Watkins is a brilliant, third generation professional magician. His passion for his art and his devotion to his craft are boundless. He also performs as himself at the Palmer House in a more intimate, hour-long show called “The Magic Parlor.” As Harry Houdini, Mr. Watkins spins a tale of wizardry and illusion. The play is a biographical mysterious, often humorous drama, told through uncanny, impossible tricks that seem to evoke the supernatural. Watkins is charismatic, kind and caring in his portrayal of this master magician and is simply the best reason for visiting or revisiting this play. The story introduces us to the magician, his close relationship with his mother, Cecilia, his younger brother, Theodore, and his devoted wife, Bess. All play important roles in Houdini’s life as well as in his career in magic. The story, peppered with oohs, ahhs and spontaneous applause from the audience, delights with feats of mind-reading, coin and card tricks, levitation and escapes from handcuffs, rope and chains, all culminating in the famous Chinese Water Torture Cell. While the story is mesmerizing, it’s Houdini’s/Watkins’ magic that’s simply unbelievable to behold. In addition to Mr. Watkins, the eight-member ensemble is equally magical. The terrific Shawn Pfautsch is great as Theo, lovely Carolyn Defrin is a beautifully loving Bess, Marika Mashburn creates a humorous, gruff Hungarian mama Cecilia and Johnny Arena becomes a masterful Ringmaster for this circus of magic. Tommy Rapley is, among other characters, a frightening, towering figure as Death, and Julia Merchant and Rashaad Hall deftly play multiple harry2supporting roles as multitasking ensemble members. Allen’s production is well supported by Lee Keenan’s period costumes, Harrison Adams and Kevin O’Donnell’s co-designed sound and original music, Tommy Rapley’s fluid choreography and Collette Pollard’s majestic scenic design, illuminated by Ben Wilhelm’s lighting. Houdini once said of magic that what the eyes see and the ears hear the mind believes. In this exciting, mind-boggling production, remounted by the always impressive House Theatre of Chicago, the audience’s mind will be expanded and blown away by everything seen and heard, just a few feet away from each spectator. Several audience members are even encouraged to participate in many of the tricks making the experience even more intimate and authentic. Seldom has a biographical drama been more beautiful, breathtaking and sheer fun"
Death and Harry Houdini- Dan Zeff, ChicagoTheaterReviews.com - "Death and Harry Houdini” was the House Theatre’s first production back in 2001 and the show has become a meal ticket for the company over the years. “Harry Houdini” has been a success both in Chicago and in Miami and it’s now back at the Chopin Theatre, drawing sellout and enthusiastic lovers of magic, which includes just about everyone. “Death and Harry Houdini” is built around Dennis Watkins, a fine actor as well as a fine magician. Watkins plays Harry Houdini and performs many of his tricks, illusions, and escapes at virtually point blank range in the intimate Chopin Theatre playing space. There are card tricks, disappearing and reappearing gold fish, a character apparently divided in half in a box, and Watkins walking barefoot over a spread of broken glass (during which stroll the spectators alternately gaze in appalled fascination or look away). Most of the tricks will be familiar to magic show fans, but that doesn’t make them any less entertaining or puzzling. The climax of the production is the Chinese Water Torture Cell. Watkins/Houdini is lowered head first into a large tank of water, his feet shackled, and all access to the tank padlocked from the outside. Shortly after the immersion, a curtain that covers the tank is pulled back so the spectators can verify that the man is actually inside, holding his breath and trying to escape a watery grave. Needless to say, Watkins/Houdini survives, reappearing in a startling manner to great applause and the relief of the audience. The show is written and directed by Nathan Allen as a loosely told biography of Houdini, from his craving as a young man to become a magician to his death in 1926 at the age of 52. It’s a ramshackle narrative, somewhat in the style of an edgy Bertolt Brecht-Kurt Weill musical from the 1920’s. The show doesn’t demand great acting, but everyone in the ensemble does what is asked of him or her, serving as acolytes for Watkins and his flawless escapes and feats of sleight of hand. The chief supporting characters characters in the biography are Houdini’s brother Theo (Shawn Pfautch), who becomes his assistant and the architect of many of his escapes, his dancer-wife Bess (Carolyn Defrin), his mother (Marika Mashburn), an addled sourpuss of an old woman, and a boisterous figure known as the Ringmaster (Johnny Arena) who weaves in and out of the action. All four are veterans of previous stagings. The ensemble is rounded out by newcomers Rashaad Hall, Julia Merchant, and Tommy Rapley. All the supporting players take on multiple roles and combine to make a goodtime amateur band, playing instruments from a saxophone and banjo to kazoos. The action occasionally shifts into fantasy with the appearance of a giant and spooky black-garbed figure on stilts who represents Death. Houdini was obsessed with defeating death his entire life. He also despised fraudulent magicians who scammed their audiences, humiliating one French performer on stage for cheating on a handcuff escape act. The audience sits in two sections facing each other. The performers are frequently within touching distance of the viewers and patrons are selected from the audience to participate (I was picked to get involved in a particularly mysterious card trick). The limited technology effects available at the Chopin Theatre do not lend themselves to extravagant production values. Still, the show has a professional gloss with platforms and pulleys, period costumes, film clips, and dramatic lighting effects, along with equipment required for the more ambitious magic and escape displays. The design brain trust consists of Collette Pollard (scenery), Lee Keenan (costumes), Ben Wilhelm (lighting), and Kevin O’Donnell (sound and original music). Tommy Rapley created the choreography. Dennis Watkins is a magician of Las Vegas caliber and we are fortunate that he has remained with the House company to dazzle us with his legerdemain. Viewers may believe they know the secret to at least a few of Watkins’s tricks, but they are kidding themselves. The thing about a magic show is that it’s not magic. If it were, the audience could just write off the tricks as unknowable supernatural manifestations beyond human understanding. But Watkins’s magic is a very human achievement rooted in technique and style. I strained mightily to decipher the performer’s tricks as they unfolded, but he had me fooled from first moment to last. The show itself is a little long and the second act has too much talk, soaking up time that would be better served by more magic. But the evening is still a dazzler"
From House Theatre - A ringmaster leads us through the events of Harry’s life, all told through stunning magic, poignent dialogue and original music. We travel from the untimely passing of his father, through his first tent shows with his younger brother Theo, meeting his wife Bess, and beginning a journey towards fame on the Vaudeville circuit. All the while, Harry feels Death close on his heels and he won’t rest until he’s conquered him once and for all. Harry will walk on broken glass, swallow razor blades and risk his life in the Water Torture Cell, but will he pull off an escape from Death? Marvel with us as Houdini battles Death once more.